I am having the hardest time finding a dress for my Retro Prom birthday party. Thank you all for the wonderful suggestions for finding vintage dresses online. They were awesome! 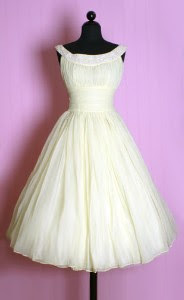 I've found some lovely, swishy, magical '50s dresses, but they are hundreds of dollars. Ugh. And, to make matters worse, I am having a hard time finding any a waist that fits a real person. A lot of them are only 23". Seriously?! My friend Camella and I even hit the town on Sunday in search of good dresses. Houston has a lot of great vintage shops. But no luck (mainly because of issue #2). I'm starting to think I might have to attempt to sew my own (which a couple of you suggested). One reader even offered to loan me a vintage pattern (thanks, This Girl Asia!). Unfortunately, I have a terrible time following patterns. As a result, I think I may have to go out on a limb and just sew the damn thing the best I can. I found a dress from Posh Girl Vintage that looks pretty easy to make. Perhaps I'm being crazily optimistic, but at least I've got the gumption to try it. The dress looks easier to sew than most because the sash takes up so much of the bodice. best wishes on your sewing... I made a dress from a pattern for the first time since middle school (when my mom held my hand through it) IT WAS HARD! it had a similar skirt, and it was a bear to attach it to the top half. Good Luck!! this sound wonderful! aren't you the one that highlighted/cursed the DIY phases? ha. that said, i think this one looks very doable...the skirt's layers will be difficult, but obviously so worth it. Have you thought about modifying the back of one of the too-small-in-the-waist dresses? You might ask Weddingbee's Miss Taffy. She does A LOT of this sort of thing. Here is the thing, having *JUST DONE THIS. * I've sewed without a pattern my whole life, but you HAVE to have a pattern on these dresses, and you have to be exacting with modifying it - and you'll need someone to fit it on you. All of this is because for these dresses to work, the bodice has to really fit well, which is effing hard. If the bodice isn't a great fit, it's really obvious (we discovered) because this dress is all about fitted bodice/ full skirt contrast. I'm in love with the one you posted, but a word of warning. If you do a multiple part bodice (this one is in three parts) it's going to be more complicated and time consuming. Worth it, but good to know at the front end. I say go for it, but get a helper. Also, keep in mind, you'll need to build a crinoline for under the dress (you can't buy one that will be the proper length and fullness for your skirt) which is a whole other bit of project. Good luck! If you go for it, I'll be very excited. And darn it, I'm in love with that dress in the photo. (oh, one alt idea - I have several dresses in this style, it's my party dress of choice. One of the most fab is a modern prom dress I got on sale for about $75. If you haven't looked into the modern prom dress in this style, I say do that first. Much easier, and quite possibly cheaper). I love both poshgirlvintage.com & www.unique-vintage.com -- I like to go to posh girl and torture myself looking at dresses that I could never get into the waste sizes of even with a corset. Can you add a puffy skirt and thick sash to an A-line dress to get the same effect? I am also not so good at following patterns, I say go ahead and make it yourself, and hope for the best. If you're like me, you see how the fabric fits together in your head. It may not be perfect, but other people will not notice any wee ambiguities I'm sure. Ooooh, where did you find the pic of the dress at the top of this post? I LOVE it. Meg, you actually CAN buy crinolines that will fit dresses like that.